Our field of specialization is full-color offset printing. We have modern printing equipment and leading role in polygraphy. ABAGAR JSC – Veliko Tarnovo is a modern printing and publishing house with universal possibilities of printing and well-developed publishing activities. 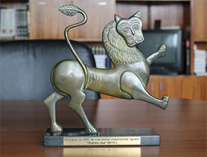 ABAGAR is a successor of Dimitar Naydenov printing house which was established in 1951. It has a 65 – year’s history and has passed through several periods of transition. The company has kept the polygraphic traditions of the past and the innovation of the last years.